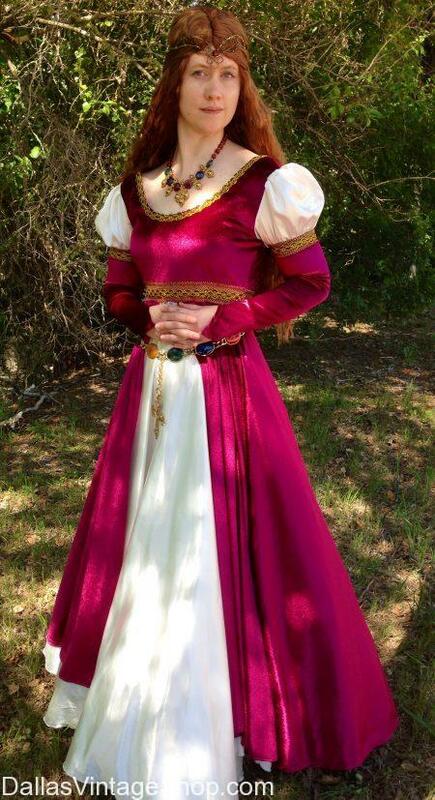 Need Renaissance Gowns for the Texas Renaissance Fest? Choose from our large selection of beautiful Renaissance gowns, wigs, necklaces, cloaks and any accessory you can think of. Be sure to allow yourself plenty of time to shop because you have many, many lovely dresses and outfits to chose from. Find Texas Renaissance Fest General Dates: Sept 29 – Nov 25, 2018. In 2017, Texas Renaissance Festival says they saw its second highest attendance season, welcoming a total of 644,917 attendees, while facilitating 63 weddings, the most recorded in a single season. Texas Renaissance Festival also saw a 14 percent increase in campers from the previous year, hosting 23,000 guests in the campgrounds. Established in 1974, the event attracts over half a million visitors each year to its 55-acre recreation of a 16thCentury European village. This immersive experience features world renowned live entertainment, works by master artists and craftspeople, award winning food and drink, hand-powered rides and games, and over 100 interactive characters during its nine themed weekends from Sept. 29 through Nov. 25, 2018. The festival and the adjacent Fields of New Market Campground are located in Todd Mission, Texas 50 miles northwest of downtown Houston. For more information, please visit www.texrenfest.com. This entry is filed under 2019 10/05-12/01 Texas Renaissance Festival. You can follow any responses to this entry through the RSS 2.0 feed. Both comments and pings are currently closed.